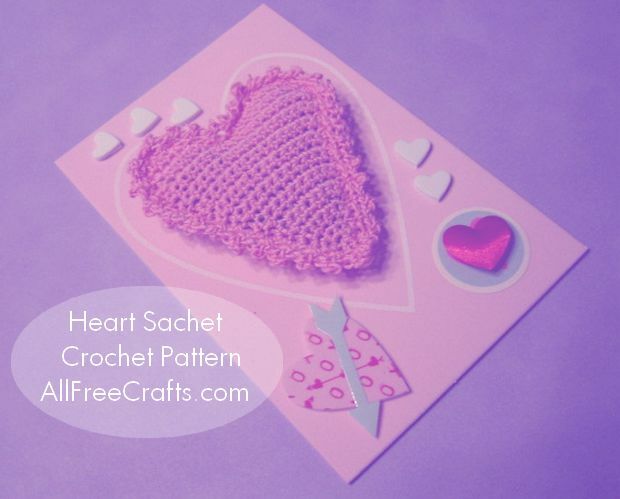 This free pattern to make a crochet heart sachet is both easy and versatile; you can fill the sachet with scented fibrefill (or lavender, as I did), then add a ribbon or crocheted loop to suspend it from a clothes hanger. Tuck two or three in your drawers, or use a single heart sachet to make a Valentine’s Day or Mother’s Day greeting card. Please note: Gauge isn’t super critical in this pattern, but will, of course, affect the finished size, so use the hook you need to get the desired size. Try a few rows and you should have a good idea of how large the completed heart will be. My heart sachet is approximately 3½ inches high and 3 inches at its widest width. I’m already planning a larger version with Handicrafter cotton yarn and a larger hook! I’ll likely replace all single crochet stitches in the following pattern with half double crochet, and I might try a different edging. I have lots of uses for heart sachets; they are so quick and easy to make, but have a magical “Awww…” factor when you give them away. Two hearts beat as one. Or they will once you join them together with single crochet around the edge. 1st row: Work 2 sc in 2nd ch from hook. Ch. 1, turn. 2nd row: 2 sc in each sc across (1 sc increased in each st). Ch 1, turn. 3rd row: Increase 1 sc at the beginning and end of the row; sc in each sc across. Ch. 1, turn. Repeat 3rd until there are 20 sc on row. 1st row: Sc in next 8 sc, draw up a loop in each of next 2 sc, thread over and draw through all 3 loops on hook to decrease 1 sc. Ch. 1, turn. 2nd row: Sc in each sc across. Ch 1, turn. 3rd row: Sc in each sc of previous row, decreasing 1 sc, as before, at end of row. Ch 1, turn. Repeat 2nd and 3rd row until 4 sc remain. Break thread and fasten off. Attach thread to 11th sc of last long row. Decrease 1 sc at beginning of row and every other row to create a matching arch to the completed side. Break thread and fasten off. Attach thread to the bottom point of the heart, ch 1, sc in same st., sc evenly all around the heart. Break thread and fasten off. One heart motif completed. 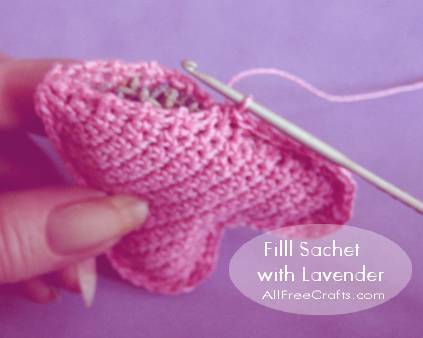 Two hearts are crocheted together and filled with lavender to make sachet. Make a second heart motif to match the first. 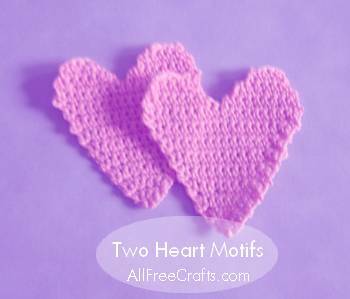 Hold both hearts, wrong side together, and join yarn at the bottom point of the heart. Ch 1, sc in same space, sc evenly around the heart, joining both hearts together. Leave an opening large enough to stuff the heart. Stuff with scented fibrefill or cotton balls. Add a few drops of your favorite essential oil to the stuffing before insertion. 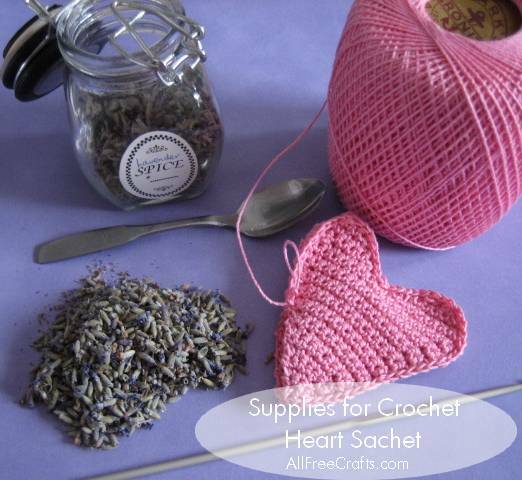 Alternatively, you can use a small spoon or funnel to fill the heart sachet with lavender, or other fragrant herbs, providing they are large enough not to escape through the holes of the pattern. If you wish to use fragrant herbs and think that pieces will fall through gaps, cut two heart-shaped pieces of muslin or similar fabric slightly smaller than the crocheted hearts. Layer two pieces of this lining fabric between the hearts before proceeding with Finishing steps. Resume sc sts to close the gap used for stuffing. Sl st to first sc to join. Ch 1, turn. * Ch 3, sc in 3 rd ch from hook – picot made; skip next sc, sc in next sc. Repeat from * around. Join with sl st to first sc. Break off and fasten. To make an optional loop for hanging the heart sachet, attach thread to center top. * Ch 3, sc in 3rd ch from – picot made. Repeat from * until loop is desired length. Join to first ch. Break off and fasten.